Mangled grammar aside, this is an “argument” we hear a lot from misogynistic men as a way of explaining away their lack of respect for women as a gender. 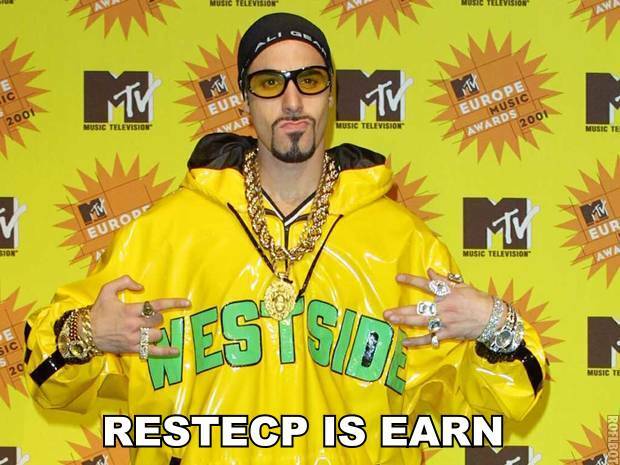 Wu thought this inadvertantly lollcatty version of this cliche was too good to let vanish in the internet ether, and suggested that the phrase “respects is earn” be immortalized in a meme. And so it was. The cat above is @RobIsAWriter’s interpretation; here (after the bump) are a few more. Even if we set aside the misogyny for a moment, it seems to me that “respect is earned” is a rather backward way of looking at it. Shouldn’t the default be respect instead of not respect? That is, shouldn’t we treat everyone with a basic level of respect to begin with, downgrading this only if the person in question says or does something that makes them less worthy of respect? And even then give them at least a minimal amount of respect for simply being human? @Bina – Respect is Owed when a Secretion is Spurned. I also made a “Freeze Peach” meme, feel free to use at your discretion…. Seems to me that seraph4377 is right about ‘respect’ vs. ‘deference’. There are basically two definitions of respect in common usage. One is the attitude we adopt towards someone because we have appreciation for their accomplishments, histories, greater age, values or so on– ‘personal respect’, which, sure, is generally ‘earned’ as part of a relationship between two persons. The other is what we’re talking about when we say ‘respect for boundaries’, ‘respect for other cultures’, ‘respecting human rights’. These characters insist that whenever anyone asks for/expects respect, we mean to force them into according us personal respect, rather than we are asking for the baseline level of concern and courtesy we owe each other as human beings. I tend to believe they are honestly confused about this, which to my mind is worse than if they are being disingenuous. I tend to believe they are honestly confused about this, which to my mind is worse than if they are being disingenuous. I’m pretty sure that common language use plays a part here. You’re much more likely to hear someone say “That’s disrespectful.” rather than “That’s rude” (or impolite or uncouth or discourteous). It comes complete with an actual reading! @ Karalora – Best anagram on that list, IMHO, ‘Increases Strep’. That’s a keeper. I have actually become very confused by the word respect lately. I was raised by a very traditional mother who demanded my respect because it was so writ in the ten commandments. Of course, what she meant by that was that she expected the highest levels of deference from me, that I should always believe her over everyone else, and that I should not expect kindness from her (it didn’t say anywhere in the ten commandments that you should be nice to your children, did it?) because she didn’t owe it to me. Of course, this reads more as the sort of relationship a King expects from a peasant, but that’s what I grew up with. So in the past, when someone has demanded my respect (usually in response to expressions of doubt, frustration, or disbelief coming from me) I start to bristle. There are very few people on the face of this earth that I respect in the way I understand the meaning of that word, and those I do have been as loyal to me as I’ve been to them for years, and even then I am no good at blind deference and have no desire to be. I don’t think blind deference leads to healthy relationships. Now, the word respect has come to mean something more along the lines of “common human decency” or “basic politeness” and the dictionary hasn’t caught up. So while I believe these men who say things like “respect is earned” and mean things like “so I’ll just go ahead and treat you like trash until you prove you’re worthy” are total asshats and deserve no pity or patience from anyone who has to put up with them, I still have mixed feelings about the word. I actually don’t like it when people say that everyone deserves respect, because the version of the word I grew up with does have to be earned. Basic human decency, on the other hand, is what we should all be treated with unless we prove ourselves to be toxic. tl:dr version: The word respect needs to pick a definition and stick with it, because I am confused. I think the best anagram is EASTER PRINCESS. Can we please, please use that as a nickname for gamergaters from now on? Those are good nicknames for GG’s, ted the fed. Also, strep. is too easily cured with antibiotics to work well here. Eek, I was ninja’d multiple times on the definition of respect debate! That’s what I get for not reading all the comments first. I’ll just second Podkayne’s ideas of personal respect vs. respect for a group, culture, or boundaries in general. I certainly expect people to respect my personal boundaries, not because they are mine, but because everyone should have an inalienable right maintain those boundaries without being challenged on them. I also might have to become one of those aggravating people who defines words such as respect and courtesy (like an academic paper) before I hold a conversation involving them, because the water there is just too muddy. @Bina: Cool! Thanks for the brain bleach! “Assfax are truth, truth assfax” is all MRAs know on earth. If respects is Ernie, then what is Bert? If respects is Ernie and Bert is disrespects, what’s Cookie Monster? So which denizen of the manosphere is Oscar? I’m tempted to say Roosh but perhaps that’s too obvious. OMG. The Amazing Atheist is Cookie Monster. Something about the look in his eyes. I broke the link! 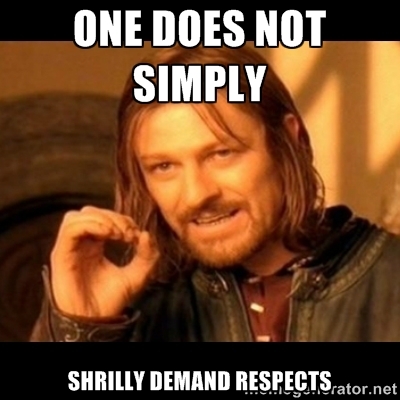 Do not shrilly demand a repost! Davis Aurini is of course Count Von Count. Cookie monster can sing quite well though, and his acting is less wooden. Actually, changed my mind. JB is Miss Piggy. I can’t believe you guys are slamming the Muppets by identifying them with manospherians. The Muppets, people! Yeah, If you’re going to compare the MRA to puppets, compare them to The Feebles. Respects is Earnie made me laugh out loud! And, David, you’re absolutely correct. According to Miss Manners, we are supposed to tread EVERYONE as ladies and gentlemen (or in other words, with that basic amount of respect), until they prove themselves to be otherwise, and undeserving of it. Now, actually respecting a person, in particular? Yes, that is earned. But we TREAT people with basic respect, whether we know, love, honor and respect them, or not. Someone who has earned our particular respect gets treated with EVEN MORE respect. This rule is what keeps us from walking down the street, shouting insults at everyone, popping them in the nose, just because we don’t like the shapes of their noses, and grabbing at any body part we do like. It is, in short, the basis of civilization, as we know it. Without basic respect for all people, we are no more than animals. Not wolves, mind you. No matter how often the MRAs like to compare themselves to wolves, wolves have respect for other members of their packs, as well as other predators. No, without that level of basic respect for humanity, in general, we are non-pack animals. The kind that eat their young, have no leadership or cooperation and basically no brains, and accomplish nothing. Oh God, that CoD one is perfect. Was smiling like crazy at the silly, then that one made break down into a giggle fit. Also Hi, lurker of about a year, trying out my new wordpress account. @rumundtopf: Have you ever seen one of those videos where the weather reporter has worn a green outfit, and the chroma key device turns them into a floating head and hands? That’s the first thing I thought of when I saw your photo of Ali G. It kind of hurt my eyes. That and all the yellow.